I did not notice any additional noise with them. Wet weather grip is insane. Sooo planted. Took me a minute to realize that the white patch was the beads. Did you lose some when you dismounted the tire? Also, can you hear a difference in road noise (all that aggressive tread)? I wear earplugs and always have my sena music when riding, but I don’t notice any tire noise at all. From what I understand, the beads are single use only. A better rider than me may feel a difference with the extra 4oz of unsprung weight from the beads. But they balance great, and I like not having weights on my wheels. Plus the beads were free, so.. Seriously? Road noise in a motorcycle tire. I have 7,000 + miles on my Road 5s on my Gen 2. Traction is great and the wear is even better than the PR 4s. Looks like i will get another 5-7,000 miles next season. Rode in several downpours and the tires gripped as they should. They are worth every penny of the cost. I've got to have a new rear soon. I just compared the price of a Road 5 to a Road 4 and the 5 was actually cheaper. Opinions anyone? Silver 05 and Faster Blue 04 FZ1. For rears I've had all the Road models. I'll still snag whichever is least expensive at the time. No GTs for the 5 yet? Not yet. Michelin has said "early 2019". Their tire finder is still directing folks to the 4 GT for bikes that require a GT tire. So I don't have to go look it up...does anyone know off hand if the Pilot 5 has steel belts for the tread? 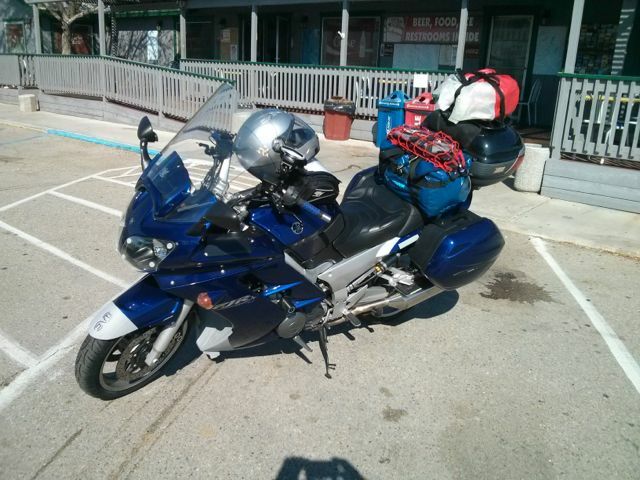 I've been using GTs on my FJR when touring because of the added weight of both the bike and the junk I lug around. I'm still not sure I need it, but have been playing it safe. I think somewhere you said you use them too? Have burned up a set of 4 GTs on the FJR. Ordered them for my Alaska trip as was carrying a lot of extra stuff wouldn't carry for most trips (gas can, tie downs for the ferry, more tools and spares than normal, sat phone etc). Ship date kept sliding so installed a set non-GT 4s. The GTs showed up the night before departure but I'd sworn off any further maintenance after packing and shakedown. Have also run hypersports front and rear, various combos, etc. Most of the time just run my cheapest-Road-rear and cheapest-Power-front combo as usual. But most of the time it's just fat me, a tail trunk and a dry bag on the rear seat if it's a trip. Alaska was the only time I ever used the sidecases. If the regular old 4s can take my fat arse and luggage from LA to Prudhoe Bay (Dalton Highway etc) don't think I really _need_ GTs. If the price is the same sure. Last edited by gotfz1; 02-07-2019 at 04:35 PM. I am going to see how far a rear PR4 GT will last, on my newer 2001, FZ1. Already have a PR4 GT front on said bike that was in near mint condition, given to me, by a very quiet rider. Cost me a Shoei Qwest chin curtain, i did not need. I picked up a as new rear PR4 GT, when i was last in Hermosa Beach, three months ago. The tire still has the faint paint lines on the threads, with all the nubs still there, and a date code of 45/17. Yet another $59.75 i will never see again, with Ca. sales tax included. lol! Threw the tire around my waist, and bike and tire, ran up to Watsonville, the next day on the FZ1. Had a few funny looks from folks in cars, on 101 north. A C.H.P. unit went by me, and had a laugh, also! So, with The Valley of Death Ride happening in exactly four weeks time from today, i will have fresh PR4 GT tires, front and back. Be interesting to see what kind of mileage i will receive, on these Mich. GT tires. I even have the same combo of tires, on the ol' 2002 FZ1 wreck. They are about new, also. Rare for me to have matching tires, front/back! lol! P.S. Just checked my rear PR4. Yep, made in Spain. Should be good to go. Last edited by Dean Dinnetz; 02-07-2019 at 07:58 PM. Doing well thanks. Will pass along the hello. Have fun in DV. IME mileage didn't differ between 4 GT and 4. Same compounds but stiffer carcass for the GT. Thanks. You convinced me. It has been a while since I ran a PR rear and a power front. I'll probably start out the riding season that way. Ahh, 395. I did not make it that far west last year. I need to do something about that. That is a great road! Front tread is 1 aramid and 2 polyester, sidewall is 2 polyester. Manufactured in Spain on 4017. Rear tread is 1 aramid and 1 polyester, sidewall is 2 polyester. Manufactured in Spain on 1918. Thank you sir...you're a good man and great American. I have this brand new tire, still in its shipping envelope. Ordered it during a great mail order sale promotion. Two weeks after getting it, I had to sell the bike. So, I would like to sell it for $ 100.00 Dollars + shipping cost. Damn...almost the size I need. Gonna be a good buy for someone.